The Mansfield City Schools Board of Education heard a detailed report about the physical condition of district schools earlier this week, but emphasized that decisions about renovations or new construction will require a great deal of study and community involvement. Dynamix Energy Services engineers Dave Schoen and Frank Hartley discussed the summer inspection of schools ordered by the board and distributed detailed reports that detailed the condition of each building’s facilities, including mechanical, electrical, plumbing and technology infrastructure. “Our dialogue at this point is about the condition of buildings. We are a very long way from making decisions,” president Judy Forney said. Vice president Renda Cline said it would be premature to discuss the costs of renovations or possible replacement of buildings. “Just be cautious about numbers. Costs today don’t include the student (storm) shelters that must be part of any new construction after 2019,” she said, citing legislative action. Scott McKenzie of Dynamix, who also is a member of the Upper Arlington Board of Education, said the cost of factoring in a student shelter for a new high school would be about $500,000. That shelter, he said, could be a gym area equipped with restrooms, food service and other elements needed during time of shelter. Stan Jefferson, a former Mansfield Senior High principal and football coach, worked with Dynamix as the district’s representative. He said it will be important to inform and involve the community as the discussion of facilities begins. “As we move forward from tonight we must get the community involved and have meetings with our staffs in each building,” he said. Jefferson recalled the campaign that led to the construction of Mansfield Senior High. “Before we built the new high school the questions were ‘Where do we want to go? A new building? Renovate?’ There was a lot of emotion,” he said. While emphasizing again that decisions about facilities will require time and study, the board praised Dynamix’s report. “Thank you guys for the work you’ve done. It puts us in a position to be proactive,” board member Gary Feagin said. “It (the report) is a great tool that we can use,” Ms. Cline added. Board member Chris Elswick was absent. You can view Dynamix’s chart detailing the condition of facilities in each building at this location online. 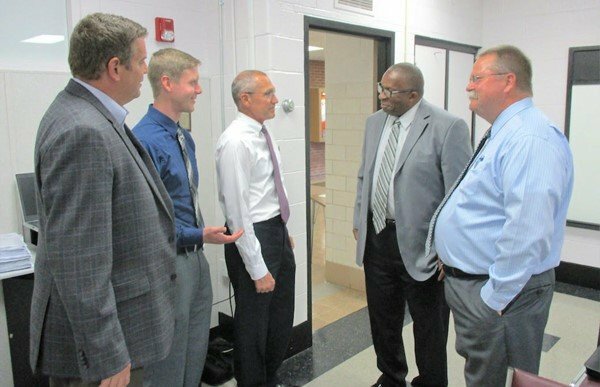 In the photo above, discussing the Dynamix Energy Services report presented at the Board of Education meeting are, from left, Dave Schoen, Frank Hartley and Scott McKenzie of Dynamix, Stan Jefferson and Superintendent Brian Garverick.